Atlantic Monthly Press, 9780871139788, 317pp. In the best-seller "The Long Emergency," James Howard Kunstler explored how the terminal decline of oil production had the potential to put industrial civilization out of business. 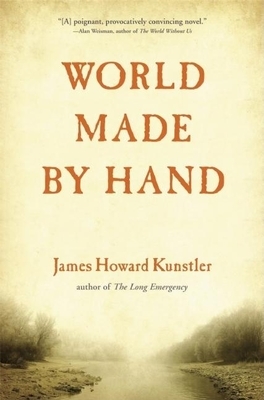 With "World Made By Hand" Kunstler makes an imaginative leap into the future, a few decades hence, and shows us what life may be like after these coming catastrophesthe end of oil, climate change, global pandemics, and resource warsconverge. For the townspeople of Union Grove, New York, the future is not what they thought it would be. Transportation is slow and dangerous, so food is grown locally at great expense of time and energy. And the outside world is largely unknown. There may be a president and he may be in Minneapolis now, but people aren t sure. As the heat of summer intensifies, the residents struggle with the new way of life in a world of abandoned highways and empty houses, horses working the fields and rivers replenished with fish. A captivating, utterly realistic novel, "World Made by Hand" takes speculative fiction beyond the apocalypse and shows what happens when life gets extremely local.